Bridge 48A is a modern foot bridge installed on 20th October 1998. It was opened for use on 14th December 1998 when it was officially opened by the local MP, Sir Nicholas Winterton. Bridge 48A replaced a nearby swing bridge hole which has been redundant for many years. It is located about halfway between br.47 and br.49 at Oakgrove (Fool's Nook), close by the lengthsman's cottage. 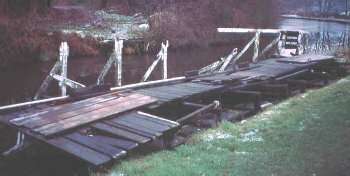 Bridge 48A is a compromise in that it provides a footpath crossing in place of that which was lost at the old bridge 48 as well as providing access to the road for the occupants of the cottage. They used to use the pontoon bridge, pictured right, which finally gave up early in 1998. For eight months the people living at the cottage had to walk the half mile to/from Fool's Nook. Adjacent to the foot bridge is Oakgrove lengthsman's cottage. This was actually built by the company that built the nearby Macclesfield to Leek road in the mid 1820's. Because the canal was being planned at the same time, the cottage was set back from the road so that it could be sold on to the Macclesfield Canal Company once the road builders had finished and no longer had a use for it. Once owned by BW, the cottage is now in private ownership. The last missing milestone was found in the garden when the cottage was refurbished - covering the cess pit!